Are Your Job Titles Helping or Hurting Your Resume? Applicant tracking systems (ATS) and job boards alike utilize keyword-driven search functionalities to evaluate resumes and assess a candidate’s potential fit. While you can’t always control your job title, you can determine how you are depicted on paper, and to a degree how your resume will be received by such technology. Will you pass, or will you fail? Creative companies may think they’re giving a nod to their unique working culture or “flat hierarchy” by providing employees with abstract titles – like “Chief Happiness Officer,” and in some cases no job title at all. Give yourself a new title. Some companies may take issue with how you publicly represent your role at the organization, so it is always best to do some research. Chances are, the job title won’t list on any official documentation until well into the interview process, and as long as you’re not misrepresenting yourself, it’s likely this will only be an issue on official legal documents, such as a contract or background check form. Let’s follow our “Chief Happiness Officer.” This person leads Startup XYZ’s human resources department and is responsible for creating a positive culture that enables the company to attract and retain top talent. As the “Chief” their role denotes that they are an executive, and probably not the person doing the day-to-day functions of an HR associate, such as payroll processing and benefits administration. Their responsibility is higher level and involves things like HR strategy, team leadership, and communication with other members of the executive team. If you’re not sure which titles are most searchable, utilize LinkedIn’s search feature or a job engine like Indeed to conduct a query for yourself. What if you can’t change your job title? As stated above, some employers may take issue with modifying your job title, for legal or other reasons. If that’s the case, you need to make clear in other parts of the resume what your title entails. So if you’re stuck with “Chief Happiness Officer” on the resume, utilize the first line of that job description – the most likely line to be read – to describe in “lay terms” the basis of your position. Despite the abstract title, it’s pretty clear what this person does, and they’ve utilized keywords absent from their job title to describe themselves in the job summary (HR, talent acquisition, strategic), so they’re increasing the chances their resume will make it through the filter. What if you don’t have a job title at all? For resume and LinkedIn purposes, you need to create one – and a good practice would be to keep it as close as possible to conventional job titles in your field. Not sure what those are? Look at companies that are comparable to yours, and search for individuals in similar roles to understand how they are being regarded in the industry. This is not the place to be creative – save that for your cover letter or bio. Your title should be easily searchable and include the most common terms that relate to your job function. 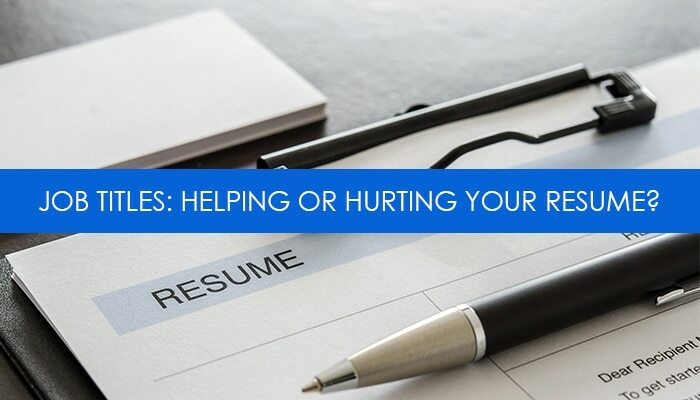 If you’re not getting hits on an otherwise good resume, your job title may be to blame. Employing a unique job title may be a good conversations starter in the interview, however, the main function of the resume is still to pre-qualify you and get a foot in the door for that initial discussion. If your job title omits the key phrases or words most relevant to your role, you may be getting passed over in searches that you would otherwise be qualified for. Do a search for relevant titles at your level and within your field. Look at how your peers and competitors are describing themselves, and consider whether changing your description can potentially improve the performance of your resume in relevant search queries. Tags: ATS, job title, resume. Bookmark the permalink.